Turkoman rugs are handmade tribal rugs that are woven by Turkmen tribes that live in northern Iran as well as in Turkey, Turkmenistan, Azerbaijan, Uzbekistan, and Syria. One of the largest Turkmen tribes is the Tekes. Therefore you will also sometimes encounter Tekke rugs or Tekke Turkmen rugs. Older names for Turkman rugs are Bokhara (Bukkara) rug or Afghan rug; occasionally one can hear even the term Caucasian carpet. Many Turkmen carpets show geometric all-over patterns, which are called ‘guls’ and usually not found in other Persian carpets. 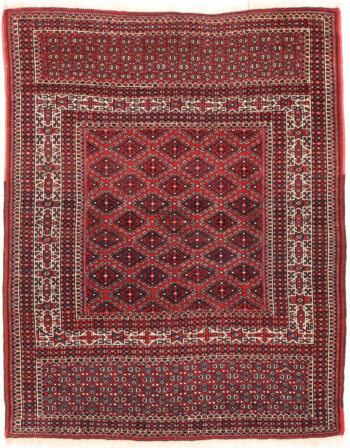 Turkmen rugs are very soft and can be burgundy, red, blue, green, or beige.